At Molly Maid, we take pride in our professional maid services, and we like to share our house cleaning expertise. 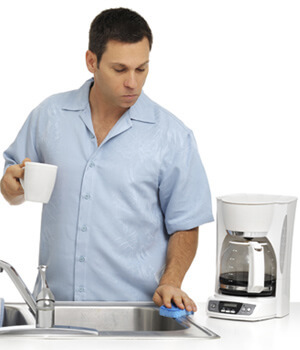 If you have a coffee maker, the coffee pot is likely to have stains. Learn how to clean it in this cleaning tips video from Molly Maid. The only cleaner needed is powdered dishwasher detergent. Put the detergent into the pot and run plain hot water through the machine. Let the hot water rest inside the pot for an hour, and then simply pour it out in the sink. Be sure to rinse out the pot several times with water to get out any lingering detergent. That’s really all it takes. This is an easy, safe way to clean the coffee pot with little time, effort, or money spent. Molly Maid also has more maid service tips on how to clean the kitchen between Molly Maid house cleaning visits.